The Kaweco Perkeo is an entry-level fountain pen that comes in four color combinations. 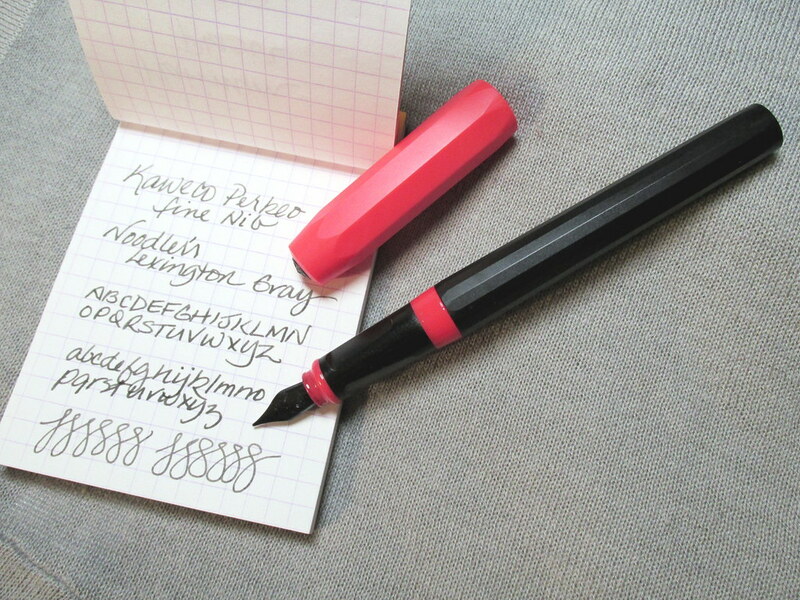 The “Bad Taste” model is black and a warm pink, the color of Rohrer & Klinger Fernambuk or J. Herbin Rouge Caroubier. I couldn’t resist the name. It’s kind of cool and raunchy at the same time. And an good wake-up call on a gloomy winter’s day. Renowned for quality craftsmanship, Kaweco has been in business since 1883 so they know a thing or two about pens. The lightweight, matte plastic Perkeo is solidly made and comfortable in the hand. It is long enough to use without the cap and well-balanced enough to be used with it. The faceted snap cap is designed to rest solidly on a flat surface so it won’t roll away. All and all, it’s a well-thought-out model that should prove a sturdy companion for years to come. The stainless steel, iridium tipped nib is stiff, but will give slightly with pressure. It puts down a consistent line thanks to its steady flow. The fine glides well with a little feedback on Rhodia paper. On junk paper, it is a little less smooth. My Lamy Safari nibs might glide a little more easily, but I prefer the grip on the Perkeo. The Pilot Kakuno is comparable in most ways except flow. The Perkeo might be a bit more controlled, but that could just be slight differences in the nibs that only someone who is incredibly picky would notice. With a light touch, I found the Perkeo pleasant to use on any paper whether for sketching or writing. It scores bonus points for an instant start following a month of no use. That’s a significant advantage for casual writers. The black and pink model seemed to fight with many colors of ink. However, a stroke of luck paired it with my favorite non-black drawing ink, Noodler’s Lexington Gray, and that settled its future. Not that Lex Gray hasn’t had many suitors, but the Perkeo makes an especially attractive mate and offers a very enjoyable nib for the ink. The Perkeo uses Kaweco cartridges and converters though International carts should work as well. Who knew a pen in “Bad Taste” would be such a find? 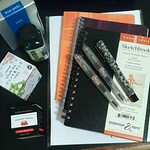 Your purchase from Amazon helps support An Inkophile’s Blog. Thank you! The Well-Appointed Desk has a review, too. Ever wondered what is the difference between High Tea and Afternoon Tea? Downton Abbey Cooks has the details. When it comes to frankenpens, vintage super flex with a converter sounds right for me. What combination of old and modern features would you cobble together? The Pen Addict Retro 51 Ice-O-Metric Is Here! A bamboo TWSBI fountain pen is in the works, but you’ll have to click through to Instagram to see the prototype. It is very cool. Would you want one? For a limited time, Noodler’s is offering two pens for the price of one. 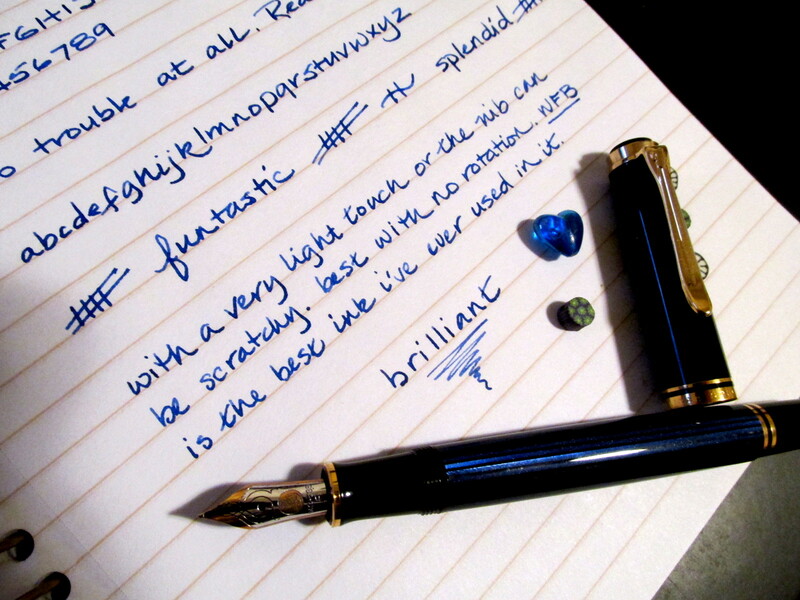 It’s a great deal that includes my favorite Noodler’s fountain pen, the Konrad #10 Dixie. The second pen is the Charlie along with a glass eyedropper to fill it. Carol of Luxury Brands USA sent a #10 Dixie Rebellion Red with a Charlie pen tucked in the Dixie’s box to introduce me to the special. Carol didn’t know the #10 Dixie Methuselah is my most oft used Noodler’s pen so a second Dixie is a real treat. My opinion of the ebonite #10 Dixie hasn’t changed since I reviewed it in 2014 though the pen has enjoyed more frequent use than I originally anticipated. It continues to be wedded to General of the Armies ink thanks to excellent flow and a degree of lubrication that is perfect for the nib. No reason to stray from such a satisfying pairing. The resin Charlie was ably reviewed by catbert a year ago and that will suffice for now since I don’t want to delay letting you know about this deal. If you’ve never tried an eyedropper filler, the free Charlie would be a great opportunity to do so. It holds more ink than other filling systems though it has been known to burp a drop of ink from time to time. The Charlie’s clear barrel with no obstructing filler mechanism shows an ink’s color to best advantage. Noodler’s Apache Sunset or Turquoise would be very eye-catching, but so would a lot of other inks. No two Charlie caps are the same according to the insert making each one unique. The pen models are completely different and so are the nibs. 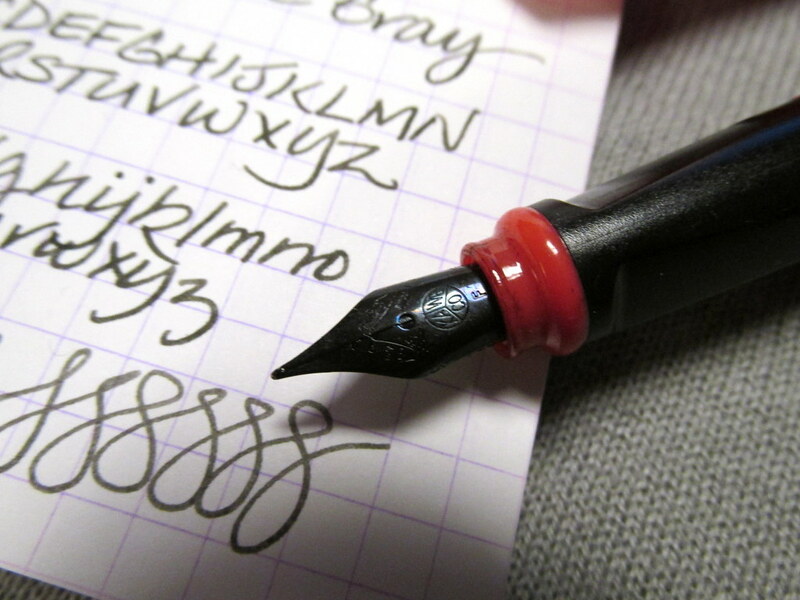 The #10 Dixie has a #6 flex nib while the Charlie has the smaller #5 with a bit of spring to it. The tines don’t open as they would for a flex nib. 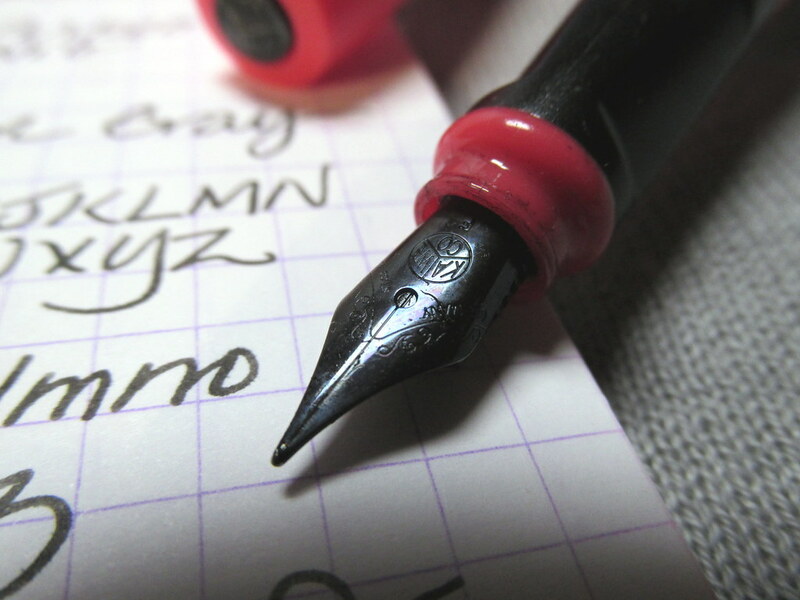 However, with a little tinkering, that nib can be swapped with a flex nib from a Noodler’s Creaper. While the Charlie pen has the typical Noodler’s aroma, if less so than some models, the #10 does not. Exposure to air helps with the resin odor, but I’ve read that storing the pen for a few days in a plastic bag filled with baking soda can be quite effective as well. As with all new pens, a light cleaning to remove any residual oil or debris from the manufacturing process is recommended. Check with your favorite Noodler’s retailer for the two pen plus eyedropper deal. It retails for $40, but it’s a limited offer so grab one while you can. Glare Fountain Pens came out with a reasonably priced line of fountain pens early this year. It’s always good to see more pens available and this one can be purchased easily via eBay. Ink is a new product that is getting good if limited buzz at Fountain Pen Network. It is currently offered on eBay at $8.75 including shipping for a 60 ml plastic bottle. I haven’t used either the pens or the ink so I can’t attest to quality. However, these video reviews have enough info to make me intrigued. How about you? While putting together my November pen rotation, two old mates decided to hook up and what a pair they make. The Pelikan M400 might be a tad small, but the nib makes up for that minor inconvenience. Waterman Florida Blue not only matches the barrel, but flows perfectly. The duo even improves my handwriting. What more can you ask of pen and ink? From healthy eating to safe computer use, this group of articles should improve your life. 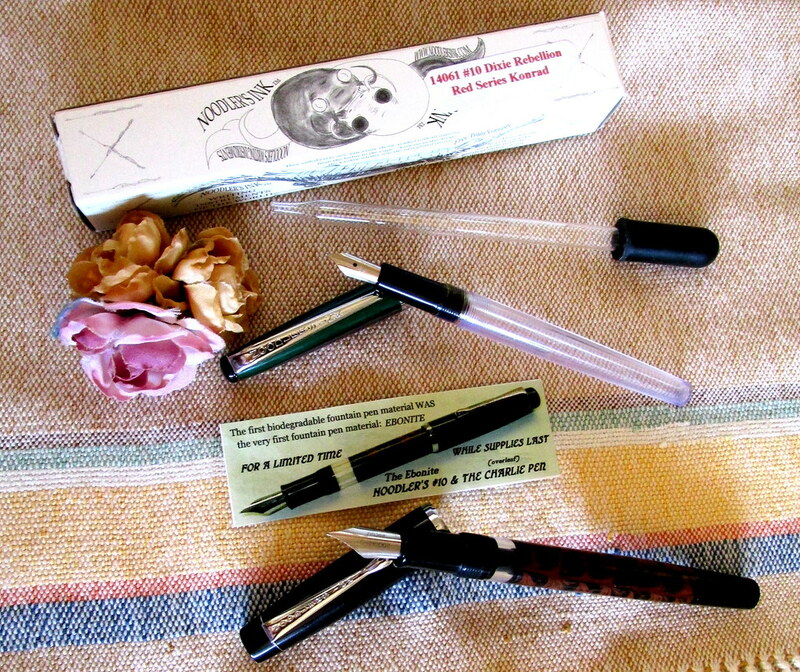 In addition, there is a luscious pen and ink photo should you like a little eye candy to top things off. 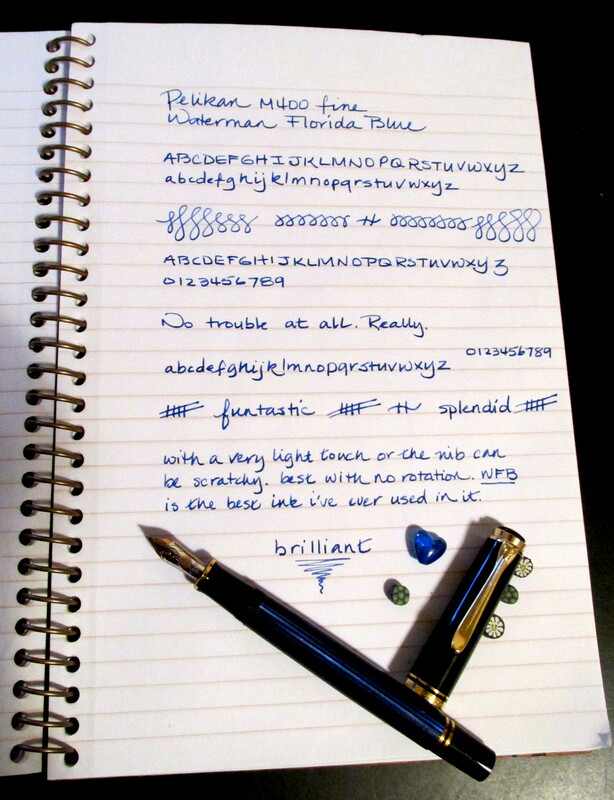 If you are a fan, Pendemonium has Legal Lapis in stock. 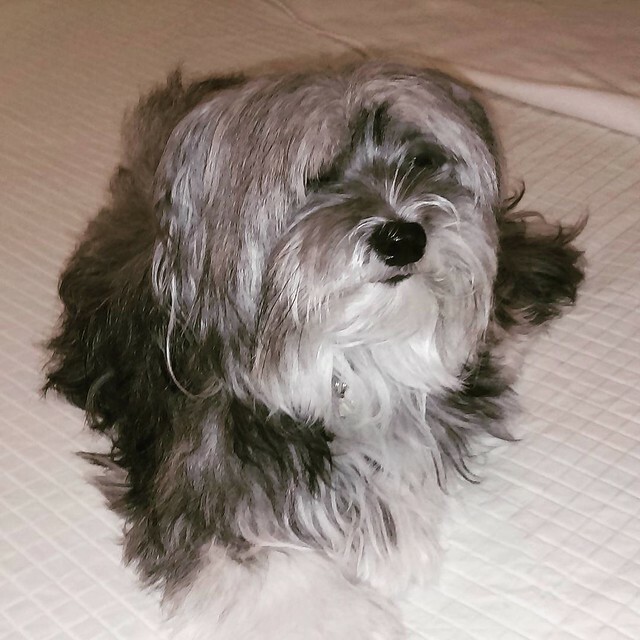 Macy needed her beauty rest after an adventurous day.